In December, my parents sold my childhood house and moved to a house on a lake. Can’t say that I’m upset! 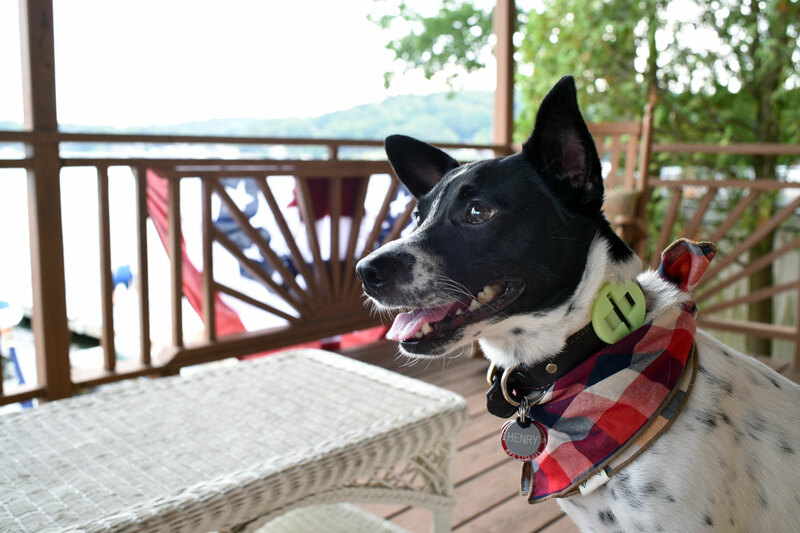 Henry and I paid a visit for Fourth of July weekend, and had a great time. The problem? In addition to the train ride, water fowl, neighbors’ dogs, and various boat noises, the lake’s fireworks show launches from directly in front of my parents’ dock. Talk about a stressful weekend for my poor pup! Thankfully, we had Only Natural Pet’s Just Relax line to take for a test run. Only Natural Pet is picky about about which ingredients they use. If an ingredient means that the final product won’t be truly natural, they won’t use it. I know I can trust everything they make! They never use ingredients from China in their food and treats, and strive to only use grass fed meats and cage free poultry. Every single Only Natural Pet product is developed and approved by their holistic veterinarian, Dr. Jean Hofve. Only Natural Pet stands behind what they sell. If your pet doesn’t love one of Only Natural Pet’s products, they’ll take it back with no questions asked! 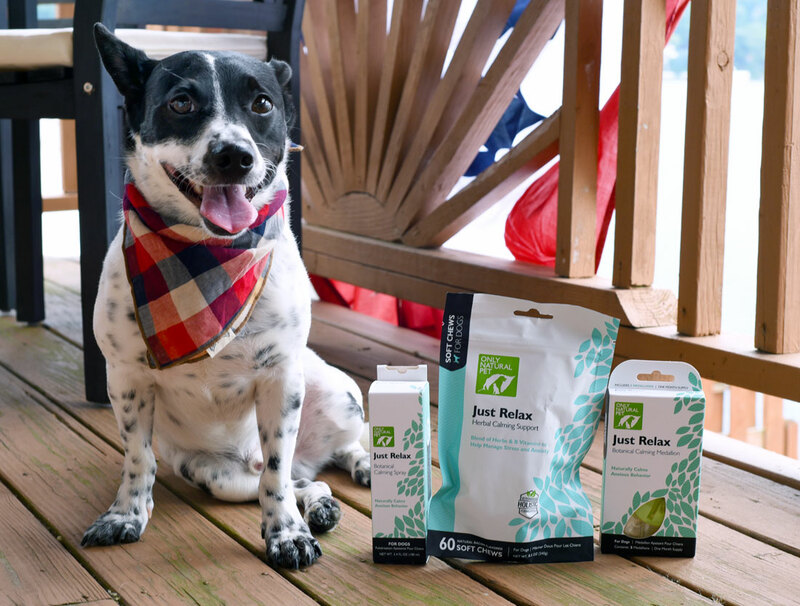 Only Natural Pet uses 100% wind power, ships with recycled materials when possible, and has teamed with BlogPaws on a Zero Waste Initiative. Even their packing peanuts are biodegradable, compostable, and can be dissolved in water. 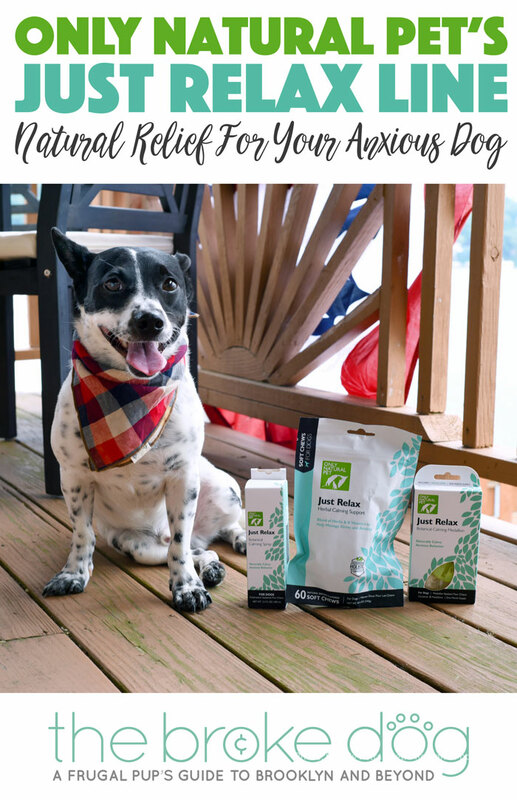 Not only does Only Natural Pet have a section on their site dedicated to Weekly Deals, they also have an automatic perks program that allows you to earn store credits each time you make a purchase. There are also attractive auto ship options that can save you up to 15% on repeat purchases! Ready for a weekend filled with strange noises and stressful situations! Are you looking for an all-natural chew that will help soothe your pup without changing his or her personality? 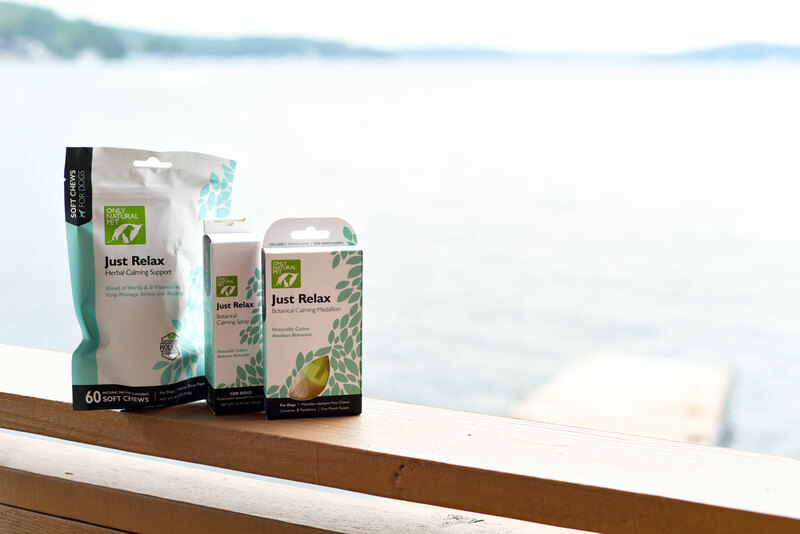 The Just Relax Herbal Calming Soft Chews might be your solution. Each chew features a potent dose of B vitamins and herbs, yet taste irresistibly like bacon. This carefully-formulated chew includes oats, chamomile, Passion flower extract, valerian root, catnip leaf, skullcap leaf, ginger, wild lettuce, and three different B vitamins. Did you know that catnip has relaxing properties for dogs? I didn’t! When I saw it in the ingredients list, I did a little extra research and found that many people use it to calm their pups. I started germinating some catnip seeds the next day! Only Natural Pet suggests using these chews for car trips, fireworks, thunderstorms, separation anxiety, or vet visits. I plan to put them to good use to help little anxious Henry adjust when we move in September. The Just Relax Botanical Calming Spray combines both lavender and valerian root essential oils to help create a relaxing environment for your stressed dog. I can personally attest to lavender’s calming powers: when I’m stressed or having an anxiety flare-up, diffusing lavender essential oils works wonders for my mood. Only Natural Pet suggest spraying this product on beds, crates, car areas, or entire rooms. Look how happy and relaxed Henry looks with his Calming Medallion! This is such a cool product! The Just Relax Botanical Calming Medallion slides onto your dog’s collar and uses aromatherapy to help calm your dog in any situation that might arise. Each medallion lasts 15 days, and utilizes valerian and lavender’s calming properties. 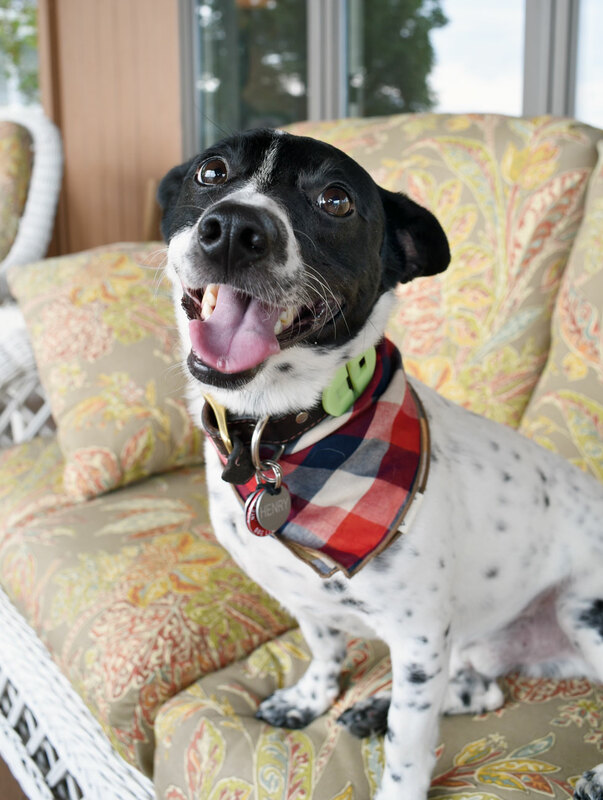 The medallion ensures that your dog will have stress support, no matter what surprises pop up. Plus, each box comes with two medallions for a one-month supply total. Now that I’ve told you about these products’ wonderful qualities, you’re probably wondering how they worked! The fireworks were scheduled for June 30, and my my parents had a small party with about ten of their friends. 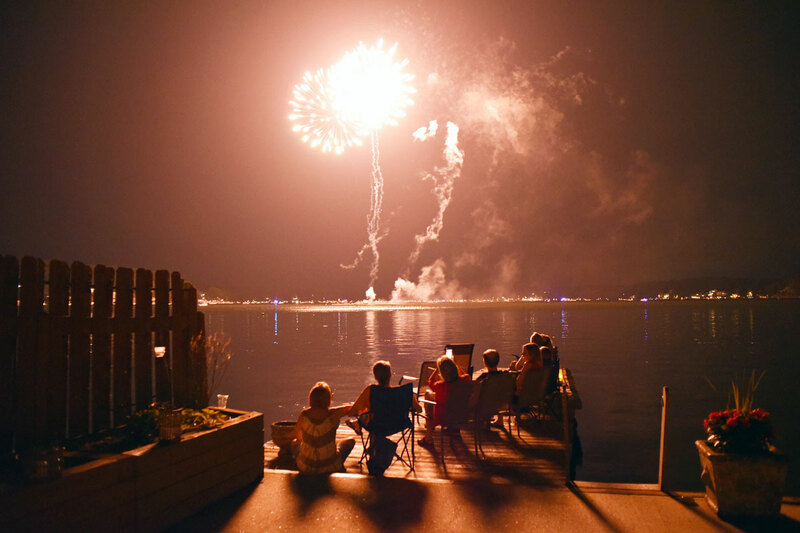 From past experience, I knew that Henry does better with fireworks when he can see what is making the noise, so I parked us on the upper deck while the “grown ups” sat down at the water’s edge. Calmly waiting for the fireworks to start. Everything started out great! Before the big show, I gave Henry half a Just Relax Calming Soft Chew and slid the Just Relax Calming Medallion on his collar. I then spritzed my clothes and the couch with the Just Relax Calming Spray. We were both feeling pretty calm! 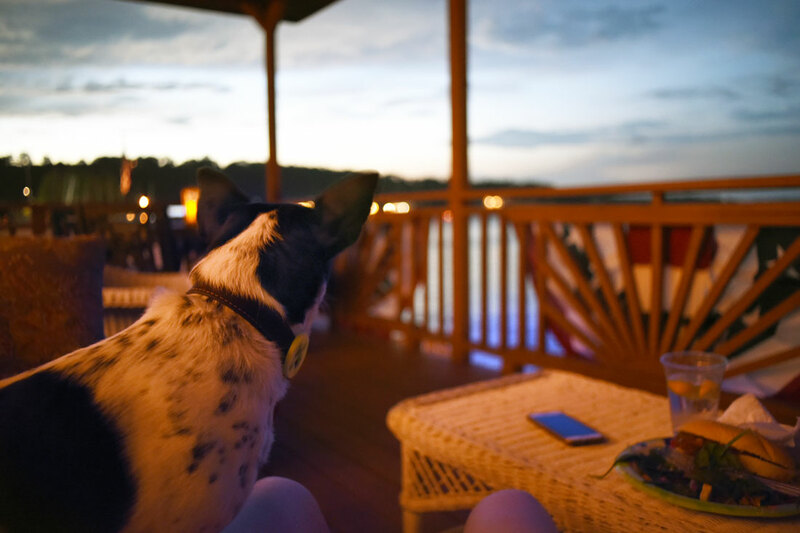 While waiting for the official show, Henry and I watched rogue fireworks leap from neighbors’ yards and from docks across the lake. He watched inquisitively and calmly. I was thrilled! Then, a neighbor two doors down set off the LOUDEST firework I’ve ever heard — every person in the house jumped — and the spell was broken. Although he didn’t bark or panic, Henry darted to the door to go inside. We spent the rest of the fireworks show in the back bedroom, with the Just Relax Calming Spray in the air and a white noise machine humming. It was a bit of a rough night, but I’m glad we had our Just Relax products to make it a little better. I’m confident that if it weren’t for that one particularly close and terrible firework, we would have watched the entire fireworks show with little issue. Oh well! I snuck down to take a few photos. After the show, Henry greeted and interacted with the party guests in a happy and relaxed manner. I’m sure the Just Relax products aided this quick recovery. In addition, he slept through the night without a hitch. Because train rides are another one of Henry’s stressors, I also implemented the Just Relax products for our ride back to the city on the Fourth. During this trip, he was calm and relaxed — despite a rowdy family that would have otherwise upset him. That night, my neighbors peppered the block with various poppers and fireworks, so Henry and I spent the evening in the bathroom. With the Just Relax Medallion, Calming Soft Chews, and Spray on our side, we survived. Fun extra thoughts: the Spray smells delightful and can also serve as a bonus air freshener. These are also the only calming treats I’ve tried that utilize valerian and catnip! Look how happy and relaxed my boy is! If you’re looking for completely natural calming aids for dogs, Only Natural Pet’s Just Relax products are a great solution. If you’re on a budget, my suggestion would be to buy the Soft Chews, and add either the Calming Medallion or Calming Spray — while they’re both great, they do use the same ingredients. Your lifestyle will determine each one (the Medallion is on your pup and “ready to go” at all times, where the Spray can be used at varying intensities), but you can’t go wrong with trying all three! Fine Only Natural Pet at their website, Facebook page, Instagram, and Twitter! Ah, if I only knew about this before, I would definitely try it! Our dog was so terrified of loud noises, especially fireworks. So we usually put him in a room with loud music that he loved to keep him from hearing the fireworks. He sadly passed away recently due to heart disease that was running in his pedigree..
Aww I’m so sorry for your loss! Thank you for your comment.